In the human eye, aqueous humor is produced from the cilliary body, and then it flows from posterior chamber to anterior chamber through the pupil. Aqueous is then drained through conventional (trabecular meshwork) and nonconventional uveoscleral pathway. Any decrease in outflow can lead to an increase in intraocular pressure (IOP). The decrease in outflow could be at microscopic level structural changes in angles, or the angle is occluded by the iris that causes the angle to be narrow. In addition, it is more likely to be seen in structurally small eyes with smaller anterior chambe (AC) dimensions. Foster has defined primary angle closure glaucoma (PACG) as both structural and functional changes in optic nerve head with occludable angle and visual field defect that correlates with glaucomatous optic neuropathy, with or without increased IOP. The current classification of PACD is according to the definition proposed by the International Society for Geographical and Epidemiological Ophthalmology (ISGEO). They have classified PACD as:(1) Primary angle closure suspect (PACS) - an eye in which there is irido-trabecular contact for at least 270° on gonioscopy with the eye in the primary position, without compression, using appropriate illumination, with normal IOP, optic disc, and visual fields. (2) Primary angle closure (PAC) - The presence of irido-trabecular contact for at least 270°, with either raised IOP and/or peripheral anterior synechiae (PAS), but with normal optic disc and visual fields. (3) Primary angle closure glaucoma (PACG) - PAC with evidence of glaucoma (optic disc/field changes). In PACD cases, there are anatomical predispositions, identified in various studies such as small corneal diameter, short axial length, shallow anterior chamber, thicker lenses, relative anterior location of lens, swelling, and anterior location of cilliary body. PACG depends upon relative pupil-block, which requires the anterior lens surface to be set sufficiently forward to permit the trigger mechanisms to act. Optical coherence tomography (OCT) is non-contact type, high resolution imaging method. It can be used to take anterior segment images and in-vivo, real time angle biometric measurements. The newer version of swept source OCT is used for angle measurements. Anterior segment optical coherence tomography machines (ASOCT) can also be very useful for prediction of progression and diagnosis of PACG case. Various parameters that can be used for studies are central corneal thickness (CCT), anterior chamber depth (ACD), angle opening distance (AOD) at 500 μm and 750 μm, trabecular iris space area (TISA) at 500 μm and 750 μm, trabecular iris angle (TIA), and scleral spur angle (SSA). Because newer technonologies are being rapidly incorporated in OCT system, different machines are available at different centers. Therefore, we aim to evaluate the comparability of measurements between two ASOCT machines to know whether their findings are interchangeable or not. This was a cross-sectional observational study, which included angle closure patients presenting to the glaucoma research facility for evaluation. The patients' were already diagnosed cases of PAC/PACG on the basis of IOP, gonioscopy, optic disc findings, and/or visual field changes according to ISGEO classifiaction. We adhered to the tenets of declaration of Helsinki during our study, and informed consent was obtained from all participants. Total 36 PACD patients (72 eyes) with age >40 years were enrolled in the study. The patients were sequentially taken over a period of 1 month. All patients underwent anterior segment biometric measurements using Casia and Visante ASOCT. The measurements were taken in a semi-lit room by a single technically experienced ophthalmologist(dewang angmo [DA]) on both the machines in single sitting at 5–10 min interval. Parameters studied were CCT, ACD, nasal and temporal AOD at 500μm (AOD500) and 750μm (AOD750), nasal (N) and temporal (T) TISA at 500μm (TISA500) and 750μm (TISA750), angle recess area (ARA in Casia only), trabecular iris angle (TIA in Casia only), and scleral spur angle (SSA in Visante only). Scans were centered on the pupil and taken along the horizontal axis (N-T angles at 0 to 180 degrees), using the standard anterior segment single-scan protocol on Visante and anterior segment scan protocol on Casia. To obtain the best quality image, the examiner chose the image with the least image artifacts attributable to eye motion or the eyelids. One cross-sectional scan, imaging the N and T angle of the enrolled eyes was evaluated. Scans in which scleral spur was not visualized were excluded. The ASOCT images were assessed by a single trained glaucoma specialist (DA) masked to clinical data. All the measured parameters were compared between Casia and Visante. The current definitions of angle parameters are made with an assumption that the trabecular meshwork can be found at a distance approximately 500–750 μm away from the scleral spur. For the angle related measurements, the operator marked the scleral spur and angle recess, following which the ASOCT machine automatically gave rest of the measurements. Scleral spur was identified at point of inward protrusion of the sclera with a change in curvature of its inner surface. The ACD was measured as the perpendicular distance from the corneal endothelium at the corneal apex to the anterior lens surface. The AOD measured as perpendicular distance between anterior iris surface and point at trabecular meshwork at 500 μm anterior to the scleral spur. Similarly, the AOD 750 was measured. The TIA 500 was measured with apex in the iris recess and the arms of the angle passing through a point on the trabecular meshwork at 500 μm from the scleral spur and the point on the iris perpendicularly. The TISA 500 was measured as an area bounded anteriorly by the AOD 500, posteriorly by a line drawn from the scleral spur perpendicular to the plane of the inner scleral wall to the opposing iris, superiorly by the inner corneoscleral wall, and inferiorly by the iris surface. The ARA 500 is the area of the angle recess bounded anteriorly by the AOD 500 [Figure 1]a and [Figure 1]b. Data were analyzed using Stata statistical software version 12.1 (Stata Corp., College Station, TX). Descriptive data were calculated for all the variables. Independent t test was used for comparing CCT and ACD on two systems. The Mann-Whitney U test was used for comparing the other variables. The limits of agreement were calculated for the two machines for various angle parameter measurements, and the Bland-Altman plot was plotted to ascertain the limits of agreement between the angle parameter readings of the two ASOCT machines. A P value < 0.05 was considered as statistically significant. Total 72 eyes of 36 PACG patients were recruited, out of which 25 were females (69.5%) and 11 males (30.5%). However, scleral spur was visualized in only 44 eyes. All 44 eyes were phakic, and all the eyes were studied for both N and T angles. The average age of the patients were 59.48 ± 7.95 (range: 75–40) years. The angle parameters measured with Casia and Visante ASOCT are shown in [Table 1]. The mean CCT was 522.5 ± 34.75 μm and 539.55 ± 29.56 μm on Casia and Visante, respectively with no significant difference between two machines (P < 0.0001). The ACD was 2.144 ± 0.38 mm and 2.133 ± 0.39 mm on Casia and Visante, respectively, and difference between the two was not significant (P = 0.487). There was a statistically significant difference between the N and T, AOD and TISA in the two machines (N AOD 500, P < 0.037; N AOD750, P < 0.041; T AOD500, P < 0.0001, T AOD750, P < 0.002; N TISA 500, P < 0.004; N TISA750, P < 0.022; T TISA500, P < 0.0001; and T TISA750, P < 0.0001) using Mann-Whitney U test. We found that ACD and CCT had good intraclass corelation between two machines (ACD = 0.9816 and CCT = 0.772), but rest of the paramerters were poorly co-related [Table 2]. The Bland-Altman plot analysis was done for all parameters and has revealed good agreement between ACD and CCT but poor agreement between rest of the parameters [Figure 2]. The limits of agreement for different parameters were calculated (with 95% confidence interval) between two machines. The limits of agreement between Casia and Visante for ACD were +0.22 to −0.20 mm, CCT was +37.5 to −71.5 μm, N AOD 500 was +0.41 to −0.30, N AOD 750 was +0.50 to −0.34, N TISA 500 +0.19 to −0.12, N TISA 750 was +0.27 to −0.19, T AOD 500 was +0.42 to −0.23, T AOD 750 was +0.43 to −0.24, T TISA 500 was +0.16 to −0.07, and T TISA 750 was +0.26 to −0.12 [Figure 2]. OCT, a noninvasive imaging modality that uses low-coherence light to obtain a high-resolution cross-section of biological structures, has evolved dramatically over the years. Different types of ASOCT are being used for angle assessment in angle closure cases.,, For proper assessment of angle biometry, the identification of scleral spur is extremely important and the entire angle measurement depends on it. The observer manually marks the scleral spur and angle recess. Scleral spur can be identified as the point of inward protrusion of the sclera with a change in curvature of its inner surface. However, the scleral spur may not always be visible even with the ASOCT. A clinic-based study, including 502 participants aged 50 years or older, showed that the scleral spur was detected in 72% of the Visante OCT images, and that the superior and inferior quadrants were less detectable compared with the N and T quadrants., Therefore, we took only N and T angle studies and compared the parameters in the two systems. The measurements were taken as per previous studies and algorithms. In our study, we took all the measurements in a single sitting by a single trained opthalmologist in a semi-lit room. 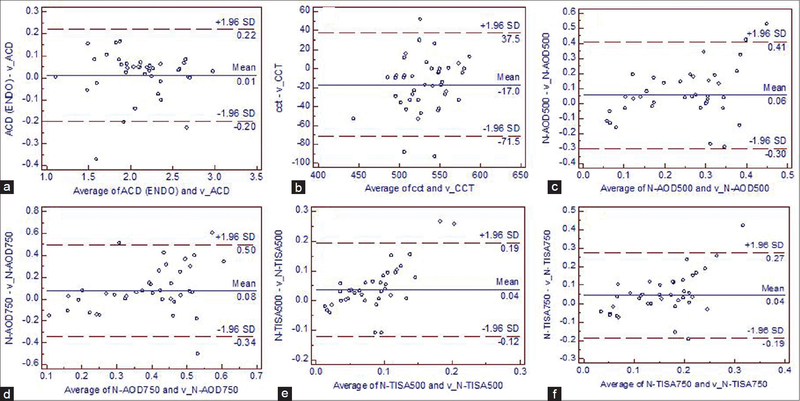 We found no significant difference in ACD values; however, other parameters such as CCT, N and T AOD 500, AOD 750, and TISA 500, TISA 750 were significantly different with poor correlation and poor agreements between the two machines. Hence, overall the results of both machines did not match for biometric measurement in PACD cases. In addition, the findings between the two machines did not correlate well to give fixed regression formula for conversion of one machines value to the other. These discrepancies between the two ASOCT devices may be explained by the faster scan speed and higher resolution images of swept source-OCT (SS-OCT) resulting in a better imaging capability of anterior chamber with minimal artifacts as compared to Visante-OCT. The SS-OCT makes use of a single detector with a rapidly tunable laser as a light source. The Casia is a Fourier-domain, SS-OCT designed, specifically for imaging the anterior segment. This system achieves high-resolution imaging of 10 μm (axial) and 30 μm (transverse) and high-speed scanning of 30,000 A-scans per s. With a substantial improvement in scan speed, the anterior chamber angles can be imaged 360° in 128 cross-sections (each with 512 A-scans) in about 2.4 s. In comparison, Visante uses super-luminecent diode laser of 1310 nm wavelength. It has slower scan speed of 2048 scans/s and a poorer axial and transvere resolution of 18 μm and 60 μm, respectively as compared to Casia. On the customized platform of the Visante-OCT, moving the superior and inferior eyelids out of the way can be quite difficult, particularly for the left eye. There are few studies where angle measurements on different types of OCT systems were compared like Sakata et al. (2010) and Leung CK et al. (2008). They have compared slit lamp (SL-OCT, Heildelberg Engineering, Heildelberg, Germany) OCT and Visante (Carl-Zeiss Meditec, Dublin, CA, USA) for angle measurements and found that VisanteOCTand SL-OCT demonstrate high inter observer reproducibility for anterior chamber angle measurements, but their agreement was poor. Hence, they concluded that anterior chamber angle (ACA) measurements obtained with each device were not interchangeable. We had a limitation of small sample size and chance of observer mistaking in manually identifying the scleral spur and angle recess. In addition, we did not compare the anterior chamber findings with either gonioscopy or ultrasound biomicroscopy. However, there are studies in literature that have compared ASOCT machines with gonioscopy and found a fair to good agreement between instruments, with ASOCT classifying more angles as narrow than gonioscopy., We found significant differences in the measurements of the two ASOCT machines. We conclude that these two machines cannot be used alternatively or interchangeably for angle parameters measurements. Therefore, it is also not advisable to interchange between the two ASOCT machines on follow-up. Ethical approval (and/or in case, humans were involved): All procedures performed in studies involving human participants were in accordance with the ethical standards of the institutional and/or national research committee and with the 1964 Helsinki declaration and its later amendments or comparable ethical standards. Informed consent (In case, humans are involved): Informed consent was obtained from all individual participants included in the study. We would like to acknowledge the work of our Biostatistician Mrs Veena Pandey for her contributions. Chowdhury UR, Hann CR, StamerWD, Fautsch MP. Aqueous humor outflow: Dynamics and disease. Invest Ophthalmol Vis Sci 2015;56:2993-3003. Foster PJ, Buhrmann R, Quigley HA, Johnson GJ. The definition and classification of glaucoma in prevalence surveys. Br J Ophthalmol2002;86:238-42. Lowe RF. Aetiology of the anatomical basis for primary angle-closure glaucoma Biometrical comparisons between normal eyes and eyes with primary angle-closure glaucoma. Br J Ophthalmol1970;54:161-9. Fukuda S, Kawana K, Yasuno Y, Oshika T. Repeatability and reproducibility of anterior chamber volume measurements using 3-dimensional corneal and anterior segment optical coherence tomography.J Cataract Refract Surg2011;37:461-8. Huang J, Wang Z, Wu Z, Li Z, Lai K, Ge J. Comparison of ocular biometry between eyes with chronic primary angle-closure glaucoma and their fellow eyes with primary angle-closure or primary angle-closure suspect. J Glaucoma2015;24:323-7. Angmo D, Nongpiur ME, Sharma R, Sidhu T, Sihota R, Dada T. Clinical utility of anterior segment swept-source optical coherence tomography in glaucoma. Oman J Ophthalmol 2016;9:3-10. Li H, Jhanji V, Dorairaj S, Liu A, Lam DS, Leung CK. Anterior segment optical coherence tomography and its clinical applications in glaucoma. J Curr GlaucomaPract 2012;6:68-74. Sakata LM, Lavanya R, Friedman DS, Aung HT, Seah SK, Foster PJ, et al. Assessment of the scleral spur in anterior segment optical coherence tomography images. Arch Ophthalmol2008;126:181-5. Nolan WP, See JL, Chew PT, Friedman DS, Smith SD, Radhakrishnan S, etal. Detectionofprimaryangleclosureusinganteriorsegmentoptical coherence tomographyinAsianeyes. Ophthalmology 2007;114:33-9. Sakata LM, Wong TT, Wong HT, Kumar RS, Htoon HM, Aung HT, etal. Comparison of Visante and slit-lamp anterior segment optical coherence tomography in imaging the anterior chamber angle. Eye (Lond) 2010;24:578-87. Liu S, Li H, Dorairaj S, Cheung CY, Rousso J, Liebmann J, etal. 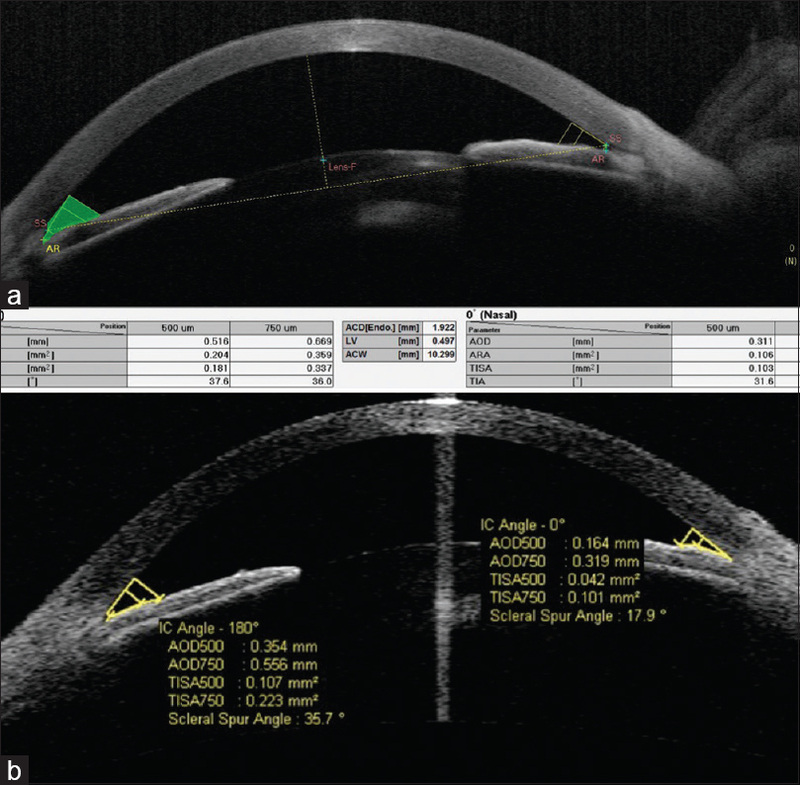 Assessment of scleral spur visibility with anterior segment optical coherence tomography. J Glaucoma 2010;19:132-5. Leung CK, Li H, Weinreb RN, Liu J, Cheung CY, Lai RY, et al. Anterior chamber angle measurement with anterior segment optical coherence tomography: Acomparison between slit lamp OCT and Visante OCT. Invest Ophthalmol Vis Sci2008;49:3469-74. Rigi M, Bell NP, Lee DA, Baker LA, Chuang AZ, Nguyen D, et al. Agreement between Gonioscopic Examination and Swept Source Fourier Domain Anterior Segment Optical Coherence Tomography Imaging. J Ophthalmol 2016;2016:1727039. Epub 2016 Nov 20. PubMed PMID: 27990300.